Charge Shot!!! : The Room Is Tearing Me Apart, Lisa! The Room Is Tearing Me Apart, Lisa! Christians have their churches, Muslims embark on the Haj, Vikings believe that when they are slain in glorious combat they ascend to Valhalla to forever drink mead from the teats of the she-goat Heiðrún, I myself have midnight movies. There really is nothing better than a good midnight movie. Whether it be a cult classic or the latest summer tentpole release, one cannot compare a normal pedestrian movie-watching experience with seeing a film in an auditorium full of like-minded cinephiles hooting and hollering along with the action onscreen. My favorite place of worship is Minneapolis' historic, world-famous Uptown Theater, an old-timey Art Deco movie hall that during daylight hours shows something artsy and respectable, but come the witching hours of Friday and Saturday nights unleashes what can only be considered the best late night entertainment in the Upper Midwest. Last Halloween, the Uptown hosted the glorious return of the Rocky Horror Picture Show, complete with shadow cast- a monthly spectacle that I do my best to attend whenever possible. 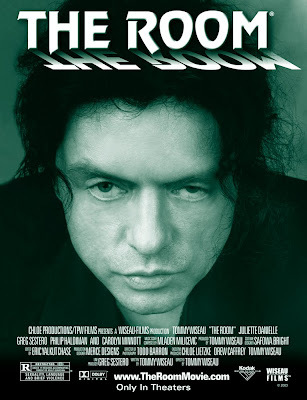 This past weekend though, a new regular fixture of the midnight film circuit finally made its way to the City of Lakes, Tommy Wiseau's 2003 oddity the Room. The Room is the stuff of trash cinema legend, the sort of story that a Tim Burton-esque auteur of the future will surely make a movie out of someday. It's the brainchild of bizarre wrtier/director/producer/leading man/probably at least four other credits Tommy Wiseau and its so bad it kind of sort of really hurts (but it's a good hurt). Ostensibly a melodrama about a successful yuppie being two-timed by his fiancée (excuse me, "future wife") the Room has taken on a life of its own as the internet generation's Rocky Horror. However, unlike Rocky which was conceived as an over-the-top camp midnight movie spectacular, the Room has all the earnestness of a high school short story contest. All of this is of course complicated by the protagonist Johnny's (Wiseau himself) indiscernible accent. Much like Arnold Schwarzenegger in his family comedy prime, Wiseau plays an average American character with a full-on foreign accent that is never explained. Many attempts have been made to figure out Wiseau's land of origin, all to no avail. I myself have shifted my opinion over the years from German, to French (but like one of the weird parts of France), to Estonian, only now to settle on Flemish. Honestly, he doesn't seem to be of this world. It's almost as if he is some sort of alien who landed on Earth saw human behavior and simply said "So shall I" and began imitating us in an effort to blend in. Characters and subplots are introduced and dropped with nary a thought. At one point, Johnny's "future wife" Lisa's mother drops by to give her daughter some womanly advice. This cancer is never addressed ever again, and the mother shows up in at least five more scenes! What really makes these monthly showings of the Room so special is not that it's a packed (and the Uptown was packed Saturday, the line to get in stretched around the block) theater full of people watching a bad movie, but rather the culture that has sprung up around it. Like Rocky Horror before it, the Room has become a game to participate in. Whenever a character is greeted by Wiseau's Johnny with his trademark "Oh, hi" the audience says it along with him. During any one of the four or five disgusting, protracted softcore love scenes, the audience claps along to the sub-Seal slow jam on the soundtrack and sings along with the lyrics ("You are my rose, you are my rose, you are my rose, you are my rose"). And when characters play a friendly game of short-range Catch (which happens a lot), viewers are encouraged to stand up and toss the pigskin around the aisles. My personal favorite gimmick has to do with Wiseau's apartment decor. For some reason the apartment is entirely decked out with framed pictures of spoons, so whenever one creeps into the frame, audience members shout a Tick-like "Spoooooooon!" and throw plastic cutlery at the screen. And of course, you have to say the film's most famous line along with Johnny. The Room (at least its Twin Cities chapter) is still in its birthing stages as a midnight phenomenon. In its native Los Angeles, its been playing on midnight screens for years. But it was beautiful to witness the beginning of something beautiful. Last year I attended a midnight showing of Repo! The Genetic Opera, another campy musical pretender to the throne of Rocky Horror. This film too was full of fans trying to create an event out of it, but it just wasn't happening. Repo was far too intentionally bad a movie to warrant this kind of sick adoration. The Room however, is an experience to be held inside and treasured forever. If you have a showing in your area, go to it. It's a lot of fun.